Federal ironclad USS Galena showing some battle damage, 1862. It’s amazing that this broadside ironclad was designed and built without the aid of computers. Someone put pen to paper and designed this. Then the parts were made by hand in some fashion or another. 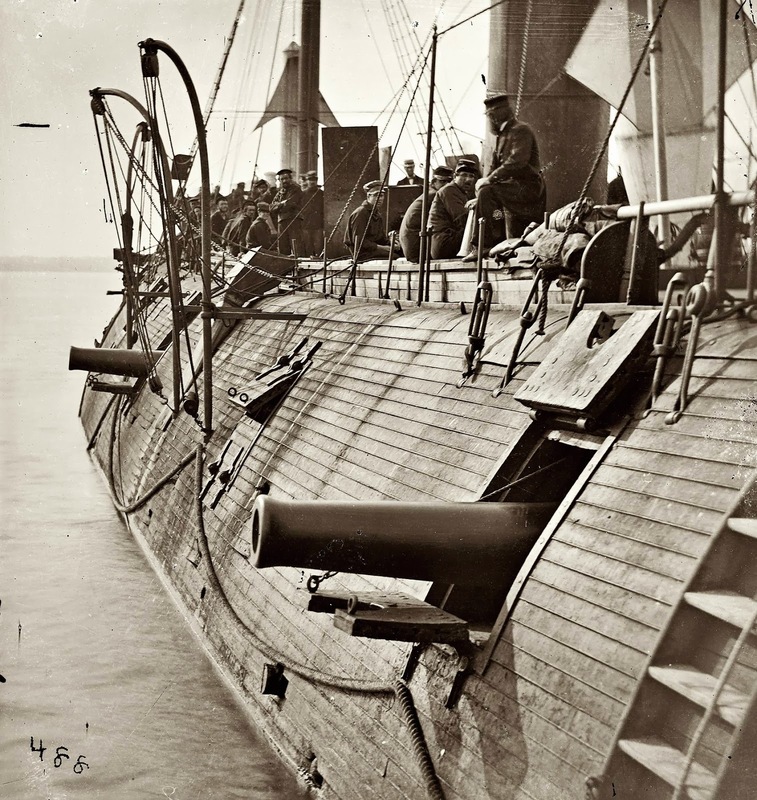 USS Galena was a wooden-hulled broadside ironclad built for the United States Navy during the American Civil War. The ship was initially assigned to the North Atlantic Blockading Squadron and supported Union forces during the Peninsula Campaign in 1862. She was damaged during the Battle of Drewry’s Bluff because her armor was too thin to prevent Confederate shots from penetrating. The Galena was one of 3 trial ironclads approved by the Ironclad Board during the early part of the Civil War. The other two were the New Ironsides, and of course the Monitor. The Galena’s method of armoring the hull was a flop so it wasn’t used on other ships. The Monitor style won out and many more were made, some with 2 turrets. The two guns in the photo are 9 inches Dahlgrens. Each nine-inch gun weighed approximately 9,000 pounds (4,100 kg). They could fire a 70–90-pound (31.8–40.8 kg) shell to a range of 3,450 yards (3,150 m). The crew would heat up low quality cannonballs in a furnace. The problem with these hot cannonballs was that it was nearly as dangerous to the firing ship as the target. Smaller than normal cannonballs were heated until they were red-hot, then loaded in the cannon, and shot at wooden ships (or land targets). They were smaller than normal because metal expands when it gets hot. On the morning of 15 May, Galena led her squadron up to Drewry’s Bluff, about 8 miles (13 km) from Richmond, where the Confederates had blocked the river and placed a battery on the 90-foot (27 m) bluff to cover the obstacles. Galena anchored some 600 yards (550 m) from the bluff and opened fire at 07:45, while the wooden ships remained further downriver. Monitor attempted to fire on the battery as well, but her guns could not elevate enough to reach it. Galena engaged the Confederate position for over three hours, until her ammunition was nearly exhausted. Her fire was largely ineffective, although her shells did manage to kill seven and wound eight members of the battery. In return, the ship was hit an estimated 44 times on her port side, of which 13 hits penetrated her armor and she had three large holes punched through her spar deck. She suffered 13 crewmen killed and a further 11 wounded. In a letter to his wife, Rodgers said that “her sides look as though she had an attack of smallpox”. Two sailors and one marine aboard Galena were awarded the Medal of Honor for their actions during the battle: Fireman Charles Kenyon, Quartermaster Jeremiah Regan, and Corporal John F. Mackie. Mackie was the first member of the U.S. Marine Corps to receive the medal. Galena was decommissioned there on 17 June 1865 until she was recommissioned on 9 April 1869 for transfer to back to Hampton Roads, where she was again decommissioned on 2 June. Condemned by survey in 1870, Galena was broken up in 1872 at the Norfolk Navy Yard.